Wednesday night saw the breaking of the news that Anchorman and Talledega Nights funnyman Will Ferrell will be joining NBC’s The Office for a four-episode arc as a “visiting branch manager” during the transition wherein Steve Carell’s Michael Scott will make his heralded exit. This joins, of course, Thursday’s cameo of original Office boss Ricky Gervais. I’ve historically been pretty hard on The Office, and I stand by those comments. I’ve harped on how the sitcom has run out of ideas, how they’ve gone off-track from the original premise, how the show’s universe hasn’t stayed consistent over the past several years. And make no mistake about it, I do feel that Carell’s exit may be a woeful death knell for The Office — but it’s actually quite a bit of inspired casting to allow Carell to go out in a great big way. If you’re any sort of religious watcher of The Office, it’s fairly clear how everything’s going to end: new HR exec Holly Flax (who richly deserves a guest-starring Emmy for her role as no other female on television has ever played so unabashedly dorky) will likely leave in the arms of Carell’s bumbling boss. If that’s how it goes down, it’s fitting; Michael Scott, for all his ills and poorly miswritten episodes which make him seem actually unlikeable, is at heart an innocent who deserves that kind of romantic and somewhat dignified salvation, and Ryan’s Holly has been a fantastically constructed character designed perfectly as his soul mate. The casting of Ferrell is at once (let’s call it what it is) a casting stunt, but it’s a smart casting stunt that makes actual sense. 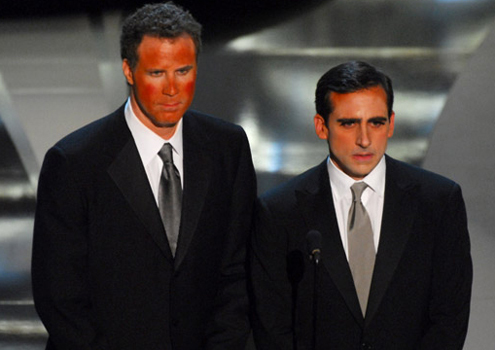 Ferrell has a longtime history of great chemistry with Steve Carell — legend has it that Ferrell and Carell both auditioned for Lorne Michaels at the same time, from which Ferrell won a legendary turn at SNL — but Ferrell is also a pretty solid comedic character actor. Granted, most of those characters are variations on the same theme, but Ferrell’s at least deft enough to mix things up so we’re not sure exactly which Ferrell we’ll be getting. Letting him come in to help usher Carell off the show will allow the two to chew some scenery in what should be a very positive way for the office. Add in a visit from Ricky Gervais, and Carell’s at least been granted the dignity to play off two reliable and able cohorts. Carell deserves that for his work over the years at The Office, and it’ll likely be pretty fun to watch. Despite my past criticisms, I think this is an admirable turn to save what otherwise would be a dismal end to the season — when Michael Scott leaves, he’s taking a lot of the funny with him. Carell will be missed, and it’s still yet to be determined who’ll take his place. Both Harvey Keitel and Danny McBride have both allegedly been courted unsuccessfully for the role, which is a good thing because the former would be a total gimmick and McBride, while great at what he does, should stick to roles which let him use profanity as wonderfully as he does. Regardless of who takes over the mantle of “World’s Best Boss,” you have to hand it to NBC for giving him a sendoff befitting his talent. What say you, America? Will Ferrell — smart move? Or too little too late? You’re right, it is going to be a major downer when Carrell leaves the show, as I’ve really enjoyed just about everything he’s done with only a few exceptions (I’m looking at you, Even Almighty) from his days on The Daily Show to his movie last year with Tina Fey. I love that they are getting Ferrell on to help send Micheal off, and again I think you’re right, that he’ll end up with Holy is really the only ending that will make me, as a fan of the character, happy. As a DISH customer/employee I’ve been able to watch The Office in HD and look forward to seeing all Ferrell’s shenanigans in awesome 1080p!